I’m getting super excited about our move! The walls are being painted this week, and we are finally in the home stretch!! Our move-in date keeps getting pushed back, but it looks like late July/early August. I must say… the one room I am most excited about in our new home is our dining room. 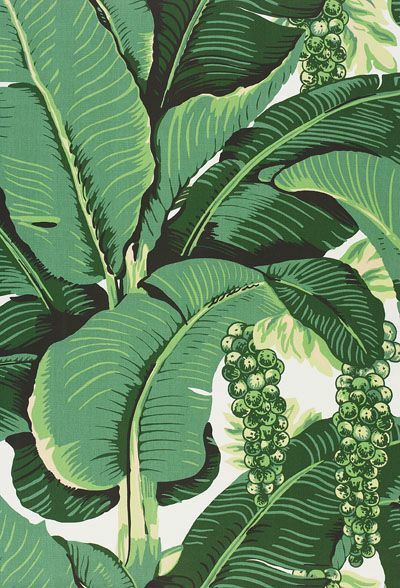 I have written before about the fabulous Carleton Varney “Brazilliance” banana leaf wallpaper that will cover our dining room walls… I am completely obsessed with this wallpaper. The rolls are currently living in our guest room waiting to be hung, and from time to time I go in and gaze upon their splendor. I tell my Brazilliance it is such beautiful wallpaper, it does not deserve to be living under the bed… and that soon it will be unveiled in its full glory for all the world to see! 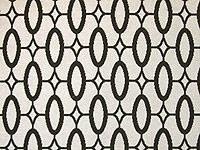 Our rug is custom, “Ellipse” by Stark in black and white. Our dining table is an Art Deco reproduction in Zebrawood that we had custom made by Deco-Dence in Dallas. Our vintage Murano chandelier is from Again & Again, also in Dallas. I’m sorry I don’t have better pictures… all of our furniture is in storage. But this is one of a pair of huge vintage Hollywood Regency pineapple lamps I scored at the estate sale of a very glamorous model from the 1960s. I cannot wait to reunite with our treasures!! I am also working on building a collection of blue and white ginger jars to decorate the buffet. Jennifer at The Pink Pagoda and Tina at The Enchanted Home have fueled my love for all things blue and white! 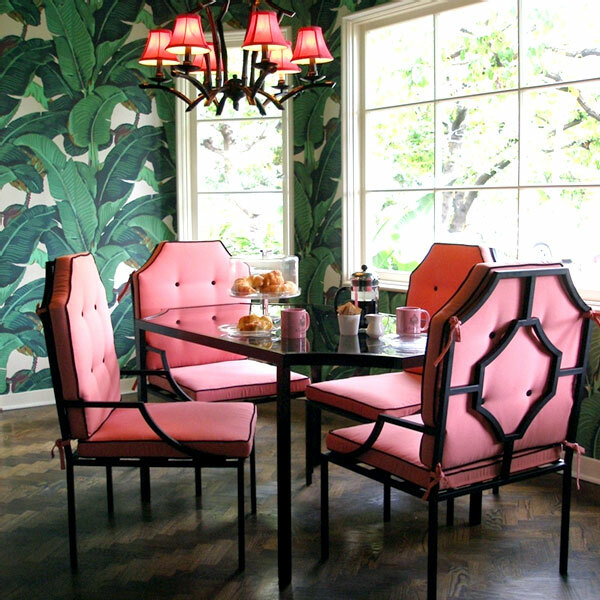 Just look at how great Nicky Hilton’s pink chairs and chandelier shades look against her Martinique Banana Leaf wallpaper! Any recommendations on where I can buy bubblegum pink silk? « Happy Pink Flamingo Day! Oh my gosh! Andrea! I LOVE your chandelier! Such treasures you have collected. Not that I have a say in this, but, I do agree with you on the pink drapes!!! Pink is a must. I can't wait to see it all come together. Thanks for keeping everyone updated. Your dining room is going to be take my breath away fantastic! What you're doing is so incredible! Thanks so much for the shout out! I love it! The paper is amazing and love the idea of pink curtains! !, I know I'm probably in the minority on this, but I don't love the blue and white ginger jars in this scheme though, I think they are distracting and disjointed with the other colors and patters going on. I adore your style and wish I were living in FL so I could decorate my house exactly like yours!!! I can't wait to see your finished dining room…it is going to be stunning! I agree with pink draperies! You really are a gifted designer, even if that was not your formal education or career. So excited that things are coming together for you, and that your home will be ready to move in to soon! Aaaamazing! 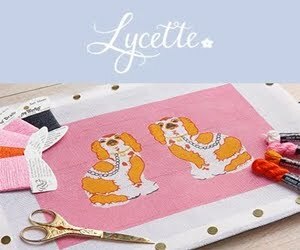 I love your inspiration board! 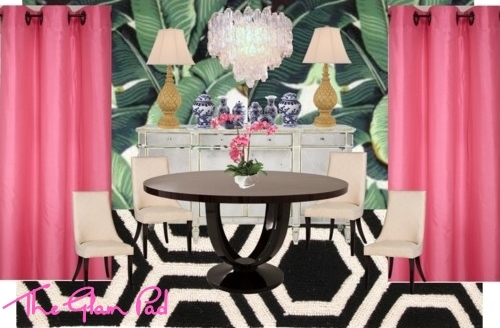 Of course the Brazilliance is beyond amazing and that mirrored dresser is beautiful! All of your treasures come together so well–I can't wait to see photos soon! In the meantime, send the Brazilliance and Marilyn my regards! Oh my gosh I can't wait to see it!! The chandelier is to die for!!!! I love all the pieces you have chosen! That dining room table is absolutely gorgeous! Also loved that you found the chandelier at Again & Again…was one of my favorite little gems when I lived in Dallas. I too have had a tough time convincing my husband to go with pink…we did compromise on a more coral-pink though.